Using this class is as easy as any object constructor. var myEnemy = new Enemy(0, 'myEnemy'); is exactly the same as what you’d use if we defined Enemy in the traditional JS way, defining methods on the prototype and so on. That’s the beauty (if you want to call it that) of ES6 classes: deep down, they’re the same thing as before, but prettier, like CoffeeScript and Typescript claim to be. constructor is a special method. (I wonder what it does…), but you can define any other method you like. You can also use get and set before method names, just like with the object literal syntax. Static methods are prefixed with static. And that’s pretty much it. e.g., "Ha! You thought I would go down that easy?" Now we have two new classes. ToughEnemy is a generic bad guy with double health. There’s not much to change for him, but it shows the super keyword that we can use to call methods of the superclass. In the constructor, you can use it by itself to call the superclass constructor. Actually, you have to. Otherwise, you can’t use this anywhere in the derived class’ constructor. Since we want to change the this.health property, we do call super, forwarding the constructor parameters to it, which also means we don’t have to deal with them. For BossEnemy, we further subclass ToughEnemy, but with a little added logic. First, we give him a property this.lives, set to 3. Then, we change his kill() method as you can see above. If he goes down to 0 health, he loses a life, but he goes back to full health. That continues until he’s out of lives, when we call the superclass kill() method. Since we didn’t define one for ToughEnemy, the call goes up another level, to Enemy, which does have kill(). So, to make a subclass, define a class as usual, but add extends and the name of the base class after your derived class’ name. Everything else is the same, except for the caveat about super in the constructor. You can change methods to your heart’s content, and any that you leave out will stay the same as they were in the base class. Just like any other OO language. Like it should be. The only downside (and a lot of people wouldn’t see it as such) is that you only get single inheritance, meaning you can only derive from one base class. That’s okay for JS, since we didn’t have anything else to begin with. And Java doesn’t have multiple inheritance, nor does C#. C++ and Python do, but it takes a lot of extra work on the programmer’s part to use it well. Basically, once you truly need multiple inheritance, you’ll know how to fake it, no matter what language you’re using. Since ES6 classes are just a fancier way of writing JS prototypes, you can use them wherever you’d use those: pretty much anywhere. And, due to the way they’re defined, you can subclass “traditional” JS objects by extending a constructor. This includes builtins like Array (but not Math, as it’s not a constructor). If you’re using a game library like Phaser, you can extend its objects with classes, too. Basically, wherever you’d already use objects and prototypes, classes fit right in. True randomness is hard to come by. On a computer, you have a few ways of creating it, such as noise circuits or measurements of user input. This randomness (entropy) is then converted by code into something usable, such as numbers or bits. On Linux and similar systems, there is a special file, /dev/random, that provides access to the random data. Some programming languages then allow developers to use the data through mechanisms like C++’s std::random_device. All well and good, right? As long as your source has enough randomness, you can generate all the numbers you need. But, contrary to thermodynamics, a computer’s entropy can run out. When that happens, /dev/random stops working, waiting until it can conjure up enough random bits to meet your needs. Other systems fare no better. Fortunately for us, games don’t often need true random numbers for gameplay. (Authentication and encryption are a different story.) So we can get away with something that only looks random. That’s good for us, because there are plenty of algorithms out there that can make a convincing string of numbers, including Math.random(). Technically, they aren’t “true” random numbers, and they all have a weakness that can allow someone with enough data to guess the next numbers in the sequence. But that very predictability comes in handy for game development. Starting from a little bit of data (from one number to a few, depending on the algorithm used), we get a whole set of numbers, billions of them or more. That starting data is the seed. There are better RNG implementations out there. Indeed, many have written JS versions of them. Here’s my attempt at the popular algorithm known as xorshift+. // Seeds the internal RNG. // with 32 bits of precision. // also clearing it for later use. I’ve written it as a Node.js module, but you can easily adapt it to a browser environment by changing module.exports on line 1 to window.xorshift or whatever you like. Whether it’s attached to the global window (browser) or loaded with require() (Node), the function creates an object with two methods: random() and seed(), both of which are explained below. Another benefit of this (or any similar RNG) over the stock implementation is that you can create more than one, each tied to its own seed. This means that, for example, you can have your world generator running off a different sequence than your AI. You would then only have to save the seed for the world RNG, while the AI RNG gets reseeded when you reload the game. This would prevent players from, say, repeatedly reloading to get a good outcome of a battle in a strategy game. As usual, I didn’t make the algorithm; I only wrote the code in this post. You can use it for whatever purpose you like, but I’m sure there are better implementations out there. I didn’t check, mostly because I wanted to try my hand at writing it first. It’s good practice. If you’re going to make a game, you’ll need to do some programming. Even the best drag-and-drop or building-block environment won’t always be enough. At some point, you’ll have to make something new, something customized for your on game. But there are a lot of options out there. Some of them are easier, some more complex. Which one to choose? In this post, I’ll offer my opinion on that tough decision. I’ll try to keep my own personal feelings about a language out of it, but I can’t promise anything. Also, I’m admittedly biased against software that costs a lot of money, but I know that not everyone feels the same way, so I’ll bite my tongue. I’ll try to give examples (and links!) of engines or other environments that use each language, too. For a very few cases, especially the situation of kids wanting to make games, the best choice of programming language might be “None”. There are a few engines out there that don’t really require programming. Most of these use a “Lego” approach, where you build logic out of primitive “blocks” that you can drag and connect. This option is certainly appealing, especially for those that think they can’t “do” programming. And successful games have been made with no-code engines. Retro City Rampage, for example, is a game created in GameMaker, and a number of HTML5 mobile games are being made in Construct2. Some other engines have now started creating their own “no programming required” add-ons, like the Blueprints system of Unreal Engine 4. Programming, especially game programming, is hard, there’s no doubt about it. I can understand wanting to avoid it as much as possible. Some people can, and they can make amazing things. If you can work within the limitations of your chosen system, that’s great! If you need more, though, then read on. Of course, the sheer number of engines might be the language’s downfall. Phaser might be one of the biggest pure JS engines right now, but next year it could be all but forgotten. (Outside of games, this is the case with web app frameworks, which come and go with surprising alacrity.) On top of that, HTML5 engines often require installation of NodeJS, a web server, and possibly more. All that can be pretty daunting when all you want to do is make a simple game. C++ is the beast of the programming world. It’s big, complex, hard to learn, but it is fast. Most of today’s big AAA games use C++, especially for the most critical sections of code. Even many of the high-level engines are themselves written in C++. For pure performance, there’s not really any other option. Unfortunately, that performance comes at a price. Speaking as someone who learned C++ as his second programming language, I have to say that it’s a horrible choice for your first. There’s just too much going on. The language itself is huge, and it can get pretty cryptic at times. C is basically C++’s older brother. It’s nowhere near as massive as C++, and it can sometimes be faster. Most of your operating system is likely written in C, but that doesn’t make it any better of a choice for a budding game programmer. In a way, C is too old. Sure, SDL is a C library, but it’s going to be the lowest level of your game engine. When you’re first starting out, you won’t even notice it. As much as I love C++ (it’s probably my personal favorite language right now), I simply can’t recommend starting with it. Just know that it’s there, but treat it as a goal, an ideal, not a starting point. Lua is pretty popular as a scripting language. Lots of games use it for modding purposes, with World of Warcraft by far the biggest. For that reason alone, it might be a good start. After all, making mods for games can be a rewarding start to game development. Plus, it’s a fairly simple language that doesn’t have many traps for the unwary. Although I’ll admit I don’t know Lua as well as most of the other languages in this list, I can say that it can’t be too bad if so many people are using it. I do get a kind of sense that people don’t take it seriously enough for creating games, though, so take from that what you will. As for the language itself, C# is good. Personally, I don’t think it’s all that pretty, but others might have different aesthetic sensibilities. It used to be that C# was essentially Microsoft-only, but Mono has made some pretty good strides in recent years, and some developments in 2015 (including the open-sourcing of .NET Core) show positive signs. Not only that, but my brother finds it interesting (again, thanks to Unity), so I almost have to recommend at least giving it a shot. Java is the old standard for cross-platform coding. The Java Virtual Machine runs just about anywhere you can think of, even places it shouldn’t (like a web browser). It’s the language of Minecraft and your average Android app. And it was meant to be so simple, anybody could learn it. Sounds perfect, don’t it? Indeed, Java is simple to learn. And it has some of the best tools in the world. But it also has some of the slowest, buggiest, most bloated and annoying tools you have ever had the misfortune of using. (These sets do overlap, by the way.) The language itself is, in my opinion, the very definition of boring. I don’t know why I feel that way, but I do. Maybe because it’s so simple, a child could use it. Obviously, if you’re working on Android, you’re going to use Java at some point. If you have an engine that runs on other platforms, you might not have to worry about it, since “native” code on Android only needs a thin Java wrapper that Unity and others provide for you. If you’re not targeting Android, Java might not be on your radar. I can’t blame you. Sure, it’s a good first language, but it’s not a good language. The me from five years ago would never believe I’m saying this, but I’d pick C# over Java for a beginning game developer. I’ll gladly admit that I think Python is one of the best beginner languages out there. It’s clean and simple, and it does a lot of things right. I’ll also gladly admit that I don’t think it can cut it for game programming. I can say this with experience as I have tried to write a 2D game engine in Python. (It’s called Pyrge, and you can find the remnants of it on my Github profile that I won’t link here out of embarrassment.). It’s hard, mostly because the tools available aren’t good enough. Python is a programmer’s language, and Pygame is a wonderful library, but there’s not enough there for serious game development. There’s always a “but”. For the very specific field of “visual novels”, Python does work. RenPy is a nice little tool for that genre, and it’s been used for quite a few successful games. They’re mostly of the…adult variety, but who’s counting? If that’s what you want to make, then Python might be the language for you, just because of RenPy. Otherwise, as much as I love it, I can’t really recommend it. It’s a great language to learn the art of programming, but games have different requirements, and those are better met by other options. Swift (SpriteKit) and Objective-C (iOS): I don’t have a Mac, which is a requirement for developing iOS apps, and Swift is really only useful for that purpose. Objective-C actually does work for cross-platform programming, but I’m not aware of any engines that use it, except those that are Apple-specific. Haxe (HaxeFlixel): Flash is dying as a platform, and Haxe (through OpenFL) is its spiritual successor. HaxeFlixel is a 2D engine that I’ve really tried to like. It’s not easy to get into, though. The language itself isn’t that bad, though it may be more useful for porting old Flash stuff than making new games. Ruby (RPG Maker VX Ace): Ruby is one of those things I have an irrational hatred for, like broccoli and reality shows. (My hatred of cats, on the other hand, is entirely rational.) Still, I can’t deny that it’s a useful language for a lot of people. And it’s the scripting language for RPG Maker, when you have to delve into that engine’s inner workings. Really, if you’re not using RPG Maker, I don’t see any reason to bother with Ruby, but you might see things differently. If there’s anything I missed, let me know. If you disagree with my opinions (and you probably do), tell me why. Any other suggestion, criticism, or whatever can go in the comments, too. The most important thing is to find something you like. I mean, why let somebody else make your decisions for you? On the surface, the title of this post sounds ludicrous. Make a language? How could anyone do that? But people have done it. I’m one of them. And this series will (I hope) help you to do the same. In the end, you should have all the knowledge needed to make your own constructed language (or conlang). Worldbuilding. 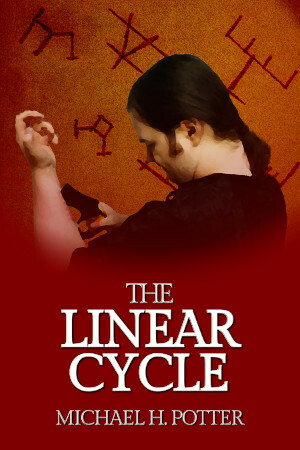 You’re an author (or a screenwriter or game developer) and you need something more than just gibberish. Sci-fi has aliens, fantasy has elves, and even Hollywood action movies might want to have the bad guys speak in something other than obvious Arabic or Russian. This is, in my opinion, the most important reason, and the one that will be the main focus of this series of posts. Examples of “worldbuilding” conlangs include Tolkien’s Sindarin (as seen in Lord of the Rings), Avatar‘s Na’vi, and the Dothraki language of Game of Thrones. Communication. The earliest attempts at created languages were mostly made to ease communication between speakers of multiple, indistinct tongues. In effect, they were trying to make their own lingua franca. That sort of thing still goes on (now usually called an “auxiliary language”, sometimes shortened to auxlang). Esperanto is the most famous example of this class of conlang, but it also includes Lojban and older efforts such as Ido and Novial. Art and philosophy. Some languages are created purely for their artistic effect, or specifically engineered to some ideal. Either way, they aren’t necessarily intended to be spoken. Rather, they’re more to be admired. The language Toki Pona fits into this class, as it was specifically designed as a kind of experiment in minimalism, while Ithkuil forms an almost perfect counterpart of extreme complexity. Secrecy. Writing down your thoughts in a form only you can understand certainly has its uses. After all, if you’re the only one who can read the language, then it’s effectively not much different from a one-time pad, right? (Well, not exactly. First, it probably won’t be much better than a cryptogram, since you’ll want something that’s easy for you to learn. Second, your notes will be as good as a key. Still, it might be fine for a diary or journal or something like that.) Obviously, there aren’t any good examples of a language like this. Fun. We don’t always need a reason to do things. Most conlangs are made because their creators wanted to make them. That includes most of my early efforts, for example. (I’d link to them, but they were never online to begin with.) Plus, it’s a good way to learn. Case in point: I hated English in school. Absolutely loathed it. Didn’t really care too much for Spanish in high school, either. Now, I’m writing this post, and I wouldn’t have done that if I hadn’t tried to make a language a long time ago. In the past 15 years, I’ve probably learned more about things like phonology, language evolution, and grammar in my spare time than many college graduates would pick up in a university setting (excluding those that major in linguistics, obviously). Well, the way I’ve planned it, the title of this post is a bit of a fib. We’re not going to make a language. We’re going to make two of them, running in parallel. Language #1 is going to be the simpler, more familiar one. It’ll be a bit like English, with a lot of other influences, especially the top languages of Europe. There won’t be much here in the way of weird grammar or sounds that make you feel like throwing up when you try to pronounce them. We’ll call this language Isian. The second language will be a bit more…advanced. Here, we can throw in odd sounds, strange words, and concepts that might boggle the mind of the average speaker of American English. It won’t be too far out there, and it won’t hold a candle to some of the real-world languages found in remote parts of Africa, the Amazon, or New Guinea, but it will be unlike any of the choices you probably had in high school. This language will be called Ardari. For both languages, before we do anything, we’ll start with a little bit of theory for the bit of creating that we’re doing. For example, the first part of the series will be about phonology, so I’ll make a post that delves into the science of phonology and talks about how that relates to conlangs in general. That will be followed by a post where we create the sound system of Isian, then another that does the same for Ardari. Sometimes, if it’s a particularly small bit of info, I’ll combine both languages into a single post. At any point along the way, comments are welcome, as are corrections and (constructive) criticism. This will be a bit of a democratic effort. (In other words, I’ll take all the help I can get!) And, of course, you’re perfectly welcome to play along at home, making your own conlang as we go. If you do, I’d love to see it, so don’t be afraid to post! Movement on a grid is common in many games, especially 2D games. In one of my current projects (a “falling blocks” game), this particular problem came up: how do you get grid-based (or discrete) movement on the X-axis while retaining free, continuous movement on the Y-axis? Specifically, I’m using the Godot engine, but the same principle should carry over to any game engine or development environment. Many 2D game engines offer physics systems, and they all tend to be pretty similar (probably because most of them use Box2D under the hood). While your game may be all about sprites, the physics code works with bodies and shapes. Roughly speaking, bodies represent the “mass” of your game objects, while a body’s shapes outline its area. When two bodies’ shapes overlap, there’s a collision, which is handled however your game is supposed to: kill an enemy, take damage from a bullet, etc. Depending on the specific engine, you have a few different kinds of shapes available. Godot, for example, lets you assign rectangles, circles, lines, “capsules” (like a rectangle with rounded caps on each end), and general polygons. If these aren’t enough, you can combine multiple shapes on a single body. Of course, most 2D engines work this way, so you probably already knew all that. For bodies, you again have options. Walls and other immobile obstacles are usually static bodies (i.e., they don’t move), and interactive elements are often rigid bodies fully under the influence of physics. The player character, in many engines, is a third type of body, the kinematic body, which causes collisions and stops when it hits a static body, but isn’t affected by forces or friction or, indeed, any physics at all. Once again, though, you already know all of this, because that’s how most 2D physics engines work. The kinematic body is the basic object representing each block, the sprite is its appearance, and the collision shape defines its area. Simple enough. Now, what we want to happen is this: move the sprite in two different ways. On the Y-axis, the block should fall down continuously, moving through every point on its way to the bottom. On the X-axis, however, we want the block to “jump” from one position to another, because the blocks have to stack perfectly. The Sprite is our image. 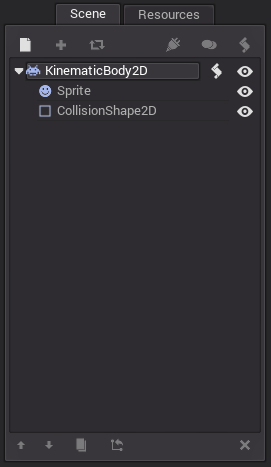 Load the icon.png file that’s included with every Godot project, and you can leave pretty much everything else as is. # If we have, then we'll add that much movement to our motion vector. # then we need to modify our motion vector. # we clear that same variable. # that's our signal to start accumulating motion. The comments tell you most of what’s going on in the code itself. Basically, what we’re doing is “saving up” the motion on the X-axis until it’s enough to move by one grid “square”, which is the width of the logo sprite. The xaccum variable holds how much motion we’ve saved, and we check it each frame (technically, each physics update period, which isn’t necessarily tied to the frame rate). If we’ve saved up enough, then we move the sprite, deducting that motion from our accumulated value. The added wrinkle is due to gravity, as you can see at the top of the _fixed_process function. Blocks in this particular scene fall at 100 pixels per second, and then they might move on the X-axis. With a vector, we can represent both of these motions, as in line 44, but then we have a problem. Kinematic bodies, remember, can cause collisions when they move, and the move() method stops when the body collides with another, as explained in the wiki article linked on line 49, which also shows how to use the slide() method to change the motion vector. 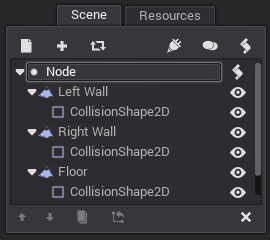 The following script should be added to the root Node of the other scene (the one where we defined the walls and floor). All it does is spawn a new block (body, sprite, and shape) whenever you press Space. Most of this is basic Godot engine stuff like creating a node instance. We do add a hint of uncertainty by spawning each new block in a random grid column. There’s a lot more that can be done with this code, and it’s probably not bug-free. There may even be a better way of going about this particular problem. If so, I’d love to hear about it! Also, even though I used Godot for this example, the same pattern will work anywhere you have 2D physics, from big names like Unity, to Phaser and other “simpler” engines. You might even be able to adapt it to work in 3D, but I haven’t really tried. Let me know what you come up with, and have fun!